View of the creation of contemporary artist Daniel Buren in the Grand Palais during the opening of ground-breaking Monumenta exhibit in Paris. Monumenta, the hugely-popular annual installation project that's in its fifth year, dares an artist of international stature to "move into" the nave of one of the French capital's most monumentus buildings, and own it. AP Photo/Francois Mori. 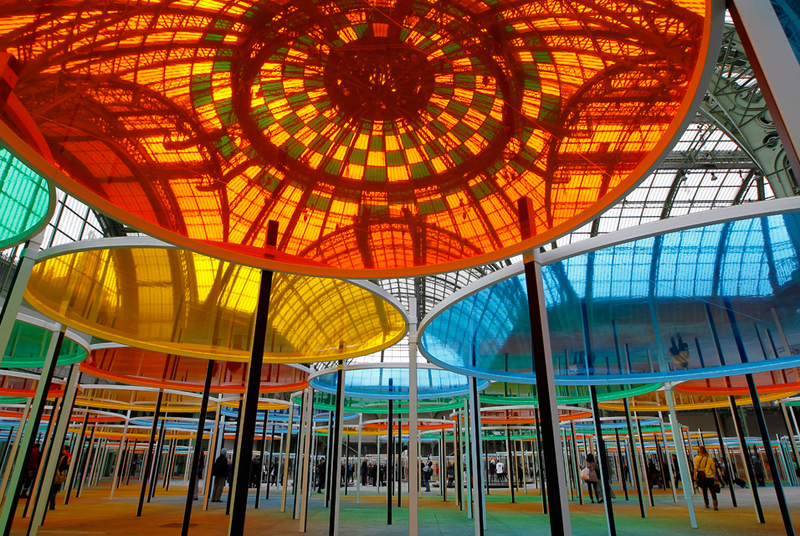 PARIS (AP).- Art lovers should expect the unexpected in the latest offering of the ground-breaking and normally roof-scraping Monumenta exhibit, as artist Daniel Buren brings the Grand Palais' lofty ceiling for the first time  literally  down to earth. Monumenta, the hugely-mediatized annual art project that's in its fifth year dares an artist of international stature to "move into" the nave of one of the French capital's most monumental buildings, and own it. With a space measuring 13,500 square meters (about 145,000 square feet) and 45 meters (150 feet) high, it's a dizzying feat for any artist, but especially for Buren. The man, a national treasure in France, is a minimalist artist. In a testament to the show's importance, French President-elect Francois Hollande dropped in Wednesday  a day before the opening to the public  for his first cultural event since winning Sunday's election. Last year's leviathan-shaped gargantua by British artist Anish Kapoor is a hard act to follow, scraping the nave's ceiling, and attracting more than 270,000 people in six and a half weeks. But as ever, Buren, who won 2007's "Praemium Imperiale" award, akin to the Nobel Prize for art, thinks outside the box. Buren's attempt sees myriad translucent circles in red, blue, green and yellow installed horizontally like a second human-scale roof, 2.5 meters (eight feet) high, supported by his signature 8-centimeter (three-inch) bars, striped in black and white. The central part directly underneath the nave is empty, save for 9 circular mirrors on the floor, shining up. At first look, it seems as if Buren has failed his Monumenta homework  to fill the space. But think again: what's the medium that fills not only the Grand Palais, but every interior ever seen? "The spirit of this place is sun, is light, which cuts through the color in the circles ... You need to feel for the space you're in ... The Grand Palais with the glass ceiling has such beautiful light, all the time  even on a rainy day," Buren told The Associated Press on Wednesday. Visitors were seen exploring furtively under the rainbow-dappled disks that stand uniformly at 2.5 meters (eight feet) high across the expanse, some in awe and others in confusion. There was a gasp as the morning's first ray of sunlight shone through the building's roof. "Wow. That's the moment I only understood it, when the sunlight came through the ceiling and hit the disks and shone of the floor: that's the beautiful part with colors everywhere, when everything came together perfectly," said Nina Aelbers, 27. Others could only describe their reaction to the work in metaphor: one viewer at a loss for words, Roberta Prevost, called the second roof a "shimmering rug or multicolored tapestry." Art critic Joost de Geest summed it up best: "Buren's art is never immediately accessible, visible. You need to stroll around to feel it. The colored circles are very light, joyous, agreeable, but you need to discover them first. Imagine this  you can walk comfortably around the Grand Palais for the first time! I like that it's on a small scale." The small size was intentional. "I've often worked in very different projects, different sizes. Some are empty, some are full, some are deconstructed. Here, again, the fundamental heart of the work was to make the work accessible and personal... I made the ceiling this low, so it would be just about the height of a person, human size. It's to re-appropriate the building for everyone," Buren said. As part of plan to democratize the space, Buren also sealed up the main entrance of the Palais, and in the process visually censored its huge doors and sweeping stairs. "Oh yes, that's the first thing I did, when I started thinking how to make this space more personal. I blocked off that entrance that doesn't work, and it doesn't need and opened up the smaller side doors at the north and south... I want the volume of air in the Grand Palais to speak by itself. That's exactly the idea." Not everyone, however, was convinced by the installation's size, and perceived lack of grandeur, such as Jonathan Hoenig, who'd seen last year's Kapoor exhibit: "When I first saw it was underwhelming. It's Monumenta  and of course I expected something bigger, more impressive from someone like Buren. Last year, Kapoor really filled the space, he was better." It's not the first time criticism has been fielded at Buren, who has previous examples in his 40-year career of sparsely endowing vast expanses. His most famous permanent work in situ at Paris' Palais-Royal, triggered a national outcry in the 1980s during the two years of its creation. Filling the entire courtyard of the famous 17th century palace, a stone's throw from the Louvre museum, Buren installed dozens of short black and white columns (again, with his signature stripes), with some standing no taller than stumps. Critics said Buren had defaced national heritage. In the ensuing outrage, the fencing around the construction site was covered in graffiti and there were even threats to destroy Buren's work. It caused a halt to the project, which was eventually completed in 1986. Twenty five years on, and the columns have since gone on to become a sort of national treasure, the marble stumps now affectionately called "The Buren Columns." Buren reflected on any hiccups in the making of his 2012 work. "Ah no, we were lucky there were no problems in the making of this installation, so we ran on time!" he admitted, jovially. Humor is a tool well-suited to weather many a storm in the fickle world of art, as Buren demonstrates well. When asked for the artistic reasoning behind his narrow choice of colors, journalists chuckled: the company that manufactured them "only had four." "Daniel Buren, MONUMENTA 2012" runs May 10 to June 21 at Paris' Grand Palais.